"This castle was built but in a few moments?" She asked, noting the jagged chunks of crystal jutting out of the arches and generally just posing a safety concern. "I guess, at least it has rooms actually built? Instead of just being a giant monolith of crystal." She asked while scraping a hoof gently across the point, seeing how sharp it was. While she hoofed mindlessly at the jutting out crystal, she listened in on them. She hoped that a magical force who is omnipotent would know how not to waste the time of these important ponies. Dunnie didn't mind traveling across Equestria, but it would be rather disheartening to see that the objective of her goal was to take out somepony's trash. As the group moved on she did too. When the door the the library was opened and she stepped in, she looked around the room at all the books, mouth wide in amazement, "Whoah. Are these all the books from the old library? Oh, that wouldn't make sense since the old library was blown up..." She thought for a moment on that, while walking forward, taking in the scenery more. "This place really seems bigger on the inside than the outside. It's amazing." She glanced back at fire, "Also why is this Princess Twilight's favorite room? I don't actually know much about her. Also I've never met her." She gasped, "Are we going to be able to meet her today?! That would be so cool!" Dunnie had just finished the last of her work at the Blueblood residence in Canterlot. After a long day of cooking, including all the preparation work and cleaning, she was exhausted. The last order of business before retiring was checking the mail. Dunnie stood in the street, in front of the mailbox as she shuffled through the papers addressed to her. Usually there was nothing important in there. However, while going though the letters, she noticed one that stuck out. "Bevel..." She muttered as she read the name aloud. As she retreated back to her room, rest of the mail under her wing, she read the letter. "A map to go somewhere?" She muttered to herself. Bevel was certainly an eccentric mare, but this was a bit strange for her. After following the map's directions, she was led to a rather unassuming house. After knocking on the door, she was sucked in. "Aaaaaa!" She shouted the whole way down, completely caught off guard. Heart of Equestria... What even could even be such a thing? The collective will of all ponies? An entity greater than both of the princesses combined? Would an entity of that power remain neutral for long? Thoughts raced through Dunnie's mind as the power of the magic table before her was revealed, even if the source of such power remained mysterious. At Fire's explanation, she nodded slowly while listening. Her eyes locked on the table throughout the explanation. A very knowledgeable pony indeed. "I suppose the princess is lucky, then, that her old residence was built atop this powerful magic?" She chuckled lightly, "Or maybe this castle would have followed her wherever she went?" Dunnie pushed herself onto her hindlegs and did the best shrug that she could. No protest came from Dunnie as Fire moved the tour along, she dropped back to her hooves and followed silently, getting close to Bevel. She smiled and leaned back, "I'll be sure to send her your gratitude. Though that might motivate her to become even more ambitious... Not that this would be a bad thing, necessarily." She chuckled, "Hmmm..." She grinned, "'Perfect masculine form', eh?" She echoed, her grin keeping up, "Maybe you are enjoying and supporting my change so that my own masculine form doesn't shadow yours any longer." She said, stifling a second chuckle. Though, now that the jesting was over, her expression softened to a more reflective one. "Well, of course my past still lingers. Who's past doesn't linger? Except maybe if somepony has amnesia or something." She turned to look away, taking a deep inhale. "Of course I am not trying to discard my whole life, I just want to continue it in the way that I want to and be happy with myself." She said, looking back to Bluebelle to meet her gaze, "Isn't that what we all want?" Dunnie gave a sidelong smile to Bevel as she was embraced suddenly, "I think this form is much preferable too, personally. However, being tall is a little overrated when you have wings." She said, flexing her own and looking back to appreciate them. "Though, I suppose magic is useful to reach things on a high shelf too." She commented and gestured to her friend's horn. "Also if we went out for a drink, I'm sure they'd be more than happy to serve you something soft." She suggested, then shrugged, having already noted that she had never seen Bevel partake in alcohol before. However, as pair began to follow the red mare, Dunnie's head hung a bit lower. The rush of emotions that had just gone through her and Fire was enough to keep Dunnie feeling a bit ill. Though, she kept going on, perhaps by the end of the tour their hearts would calm down a bit and they could make some sensible plans. She still loved her crimson comrade and was unwilling to let something silly like changing into a mare get between them. As they entered the opening, her eyes went wide. Looking like a fantasy novel come to life, the table was surrounded by six chairs, the jagged edges of the crystalline furniture was fitting for a castle that had supposedly sprouted from the ground. 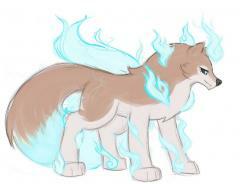 She listened to Fire speak as ashe trotted around the table, examining the table and each chair with a curious gaze. At Fire's question, Dunnie spoke up, "What happens if you are asleep or something and you don't hear your cutie mark make the annoying sound?" Despite Taira's callout to her, Dunnie already had her eyes on the approaching blue piece. She could feel Taira's mass slam into the ground after he completed his jump over Medo, all while her eyes locked on Earth Writer. He had lost the advantage so quickly, he was going to do something desperate to try to gain the upper hand. Most ponies would have jumped back, but a fighter like Dunnie knew to close the distance between opponents. Before the blue piece landed on the ground, Dunnie had already already jumped forward, challenging his aggression. Dunnie covered her mouth to stifle a giggle, "At least in Bevel's lab I know I am just a guinea pig. Though, she actually cares about my well-being, so I cannot complain." She shrugged. It was true, Bevel always treated her well. Even when it seemed like Bevel or Gearbox disregarded the well-being of Dunder or Dunnie's, it only seemed that way and was never actually the truth. "Anyway, she is the one to thank for my current form. If anything I am in her debt now." "I don't think it is any one gender's manners. It's just who I am, I like to drink my beverages quickly." She said, "Anyway, I always see royalty taking the tiniest sips and eating the smallest forkfuls." She shrugged, leaving Bluebelle to make what she would of that. The next question, however, made her tense up a hair. What now? Be like this for the rest of her life? Only sometimes? Maybe never again? As much thought as she put into it, there were more questions than answers. However, the questions were always pertaining to others while she knew exactly what she wanted. "I want to stay this way as often as possible." She said, her voice becoming a tad quieter, "If I could I would relive my whole life this way, but obviously that won't happen. So I just have to make do." At this point, Dunnie knew to look away from the flashing light. She didn't know how strong it appeared to the spectators, but so close the magical light could leave a pony blind for a few minutes. When the flash from the spell had dissipated, all that was left standing were the figures of the two stallions where the mares used to be. As Gearbox got to explaining the magic using jargon that will fly over most pony's heads in his regular jovial demeanor, Dunder suddenly became apprehensive. His already melancholic behavior dropped further, along with his head which now hung low while his hoof kicked idly against the castle floor with soft clacking. Though, when Gearbox spoke up about his attractiveness, the stallion smiled and stifled a chuckle. "You are a rather attractive stallion. And as a mare. I guess you got pretty lucky." He said, his voice low, barely loud enough for Gearbox to hear. He lifted his head to look straight at the re mare before him, "Oh, and we can go to the microbrew if you wish. But there isn't really much to 'catch up' on." He said, leaving out his thought that he could really go for a drink right about now. For they had to continue with the reason they all gathered. "Let us begin the tour." He said, still speaking softly. 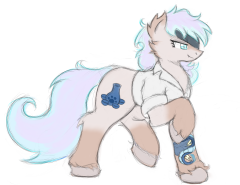 He turned to face gearbox, "But first...." He held out his hoof with the bracelet around it while looking down at the slightly shorter stallion. All she could do was roll her eyes at his, as usual, disconnected comment. Sometimes he could be insufferable, but who didn't have their quirks? Anyway, that just made his usual behavior, acting kind and charming, even more enjoyable. At the other end of the table, Dunnie adjusted her hoof so that it was holding her head up by her jaw, her head turned slightly away from the tea and and the princess. She saw Bluebelle's transformation out of the corner of her eye, hardly getting drawn in at all. She had seen the transformation process a dozen times in the mirror and with Bevel herself. Not only that, but Bluebelle's transformations were common knowledge around the house. At this point, it was probably in the job description for all staff. "Yes, you are understanding me right." Still, she did not make direct eyecontact with Bluebelle while reaching down with a wing to pick up the tea cup. She blew some steam off the top before quietly taking a sip. Dunnie appeared apprehensive to talk about herself, especially her feelings. "If I ever did feel uncomfortable about being a stallion I just repressed it and never told anypony. So much so that turning into a mare didn't even seem that attractive of an offer." She sat up, suddenly taking on a less reclusive demeanor. "Ah well, what's in the past is in the past, right?" She picked up the teacup again and knocked the whole glass back, "Eugh." She shivered, "That was a bad idea." Dunnie grunted as she was pushed back to the next available square flopping onto the ground but quickly standing back up, resuming her annoyed demeanor. It seemed as though there were a few other red pieces going up against a few blue pieces. A surprising turnout, given the size of the city. Maybe most of the ponies had the intuition to not leave their homes while something was so obviously off. "You!" 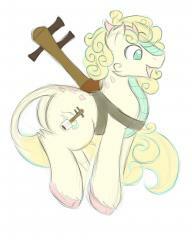 She turned and pointed her hoof at the hunky kirin, "I want to give a piece of my mind to whoever started all this. And the fastest way to get that done is by winning this game. I don't care who wins as long as I can get my shopping and cafe time in before I have to go back to work!" She turned and tapped her hoof to her chin, "Actually, if you help me get this over with quickly then you and whoever you want are invited to dinner at the Blueblood residency. What do you say?" She clasped her hooves together, slitting on the floor while doing her best to make big puppy eyes to drum up some sympathy. It was true that Dunnie was given the servant's door key. A small iron mortise key complete which betrayed the beauty of the rest of the house, while simultaneously reflecting the state of the servants of Canterlot as a whole. Rugged and worn, and ugly because it doesn't need to be pretty. She looked over at him, "I leave it in the room. In case my keys get stolen for a break-in, the front door is a lot more well guarded than the servant's door." A little bit of paranoia never hurt anypony. The safety of everypony else in the house was still a part of her responsibilities. She threw her head up to stand straight, "Anyway, I'm more useful than half of the 'dignitaries' that waltz through the front door. All they do is eat the food, drink the wine, and complain behind your back." A tad bit defensive of Blueblood, herself. Later...? Did he not like the gift? Rather than remember that the switch trigger was tea, her brain shifted immediately to overthinking the refusal. With her loss in thought, she didn't notice herself getting checked out by the prince. Dunnie appreciated the skipping of small talk and getting down to it. After listening to the prince, her eyes lit up, "Oh, you think you had something to do with this? I mean, it's true I was a little less shy of the idea because I knew that you had done it as well. However, Bevel came up with the idea herself and simply asked me to be her guinnea pig." She sat down on the floor next to the table, "What I did not expect was to enjoy this form so much, and have such complicated feelings for it." She propped her head up on the table using her hoof, "Please, lots of sugar in my tea as usual." Finally. Dunnie descended down the steps of Blueblood's house to the street. She was on break after a relatively easy morning, not that they were ever as stressful as working in a restaurant. But, in the lul between making lunch and dinner, Dunnie decided to relax for a bit and probably relax at a cafe and go shopping. However, as she looked down on the street for a landing spot, she noticed that the whole street was patterned like a grid. She glanced left and right, the whole road was the same, colored with perfect squares. "Thorough prank." Her wings carried her back down to the steps to the house, where she landed on a sheet of paper. When she looked down, she noticed she was all red. What the... am I dreaming? Or is this some elaborate magic? Quickly she swiped up the flyer that was under her hoof. She scanned the document, searching for information. Giant game of checkers, commoners blue, nobility red. Wait. "What?! I'm not a noble!" She blurted out in surprise as she glanced down again at her now red body. "Somepony's got it all wro--!" She stepped down onto the grid and was teleported to Canterlot Castle. The warping sent her mind into a tailspin, "Eugh." She struggled to keep her hoofing, so she wrapped a hoof around this large, soft, red object to keep balance. Little did she know it was a horned beefcake from Neighpon she had a leg around. Had Blueblood not interrupted, the argument would likely ended with Dunnie getting hoisted up and tossed out to the front steps. But, as to be expected, Blueblood would not settle for anything short of a dramatic entrance, or rather, a tumble into the scene. "Blueblood!" Dunnie cried out, she pushed against the guard who was body blocking her with ease. To both of their relief, Blueblood got up and brushed himself off. Another wave of relief washed over her as Blueblood vouched for her. She smiled at the prince and grinned devilishly at the guard, "You know, I got pretty close to you just now. You'd make a cute mare." 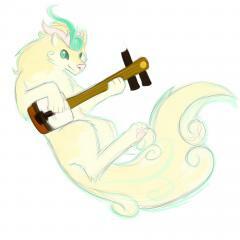 She strutted alongside the guard, brushing her tail across his nose. It was amazing to see how quickly a pony can change attitude. As the guard fled, Dunnie stuck out her tongue and held her wing in front of her nose. After all was said and done she looked over her shoulder at the stallion. Now finally able to get a good look at him, he looked different. How so, she could not say. "Thank you, Blueblood." At his lead to follow she did. "On my way back I got a gift for you, I've been hoping to try it out." With a wing she summoned a tightly bound sack from her bag, "It's coffee grown to have a very specific taste. Slightly acidic and mildly fruity, if you would like?" "We used to date." The words stung, but not as much as they used to. The words that really hurt, that realized Dunnie's worst fears, was Fire insisting that Dunnie needed "fixing." On top of Fire's refusal to return the hug. The tears welled up behind her eyes, as fears of losing one of her oldest and best friends surfaced. However, Dunnie held back the tears, as crying and causing a scene would only make things worse. As Fire showcased the golden cider and the brightly colored cupcakes, Dunnie could only look at them with an abject gaze. However, the cupcakes could offer some temporary comfort given the circumstances. Dunnie ripped the wrapper off one, eating the whole cupcake in one bite while listening to Fire explain her ideas for the castle. By the end of Fire's monologue, Dunnie had gotten through 3 cupcakes and was holding out a fourth to Bevel. "They are very good. The chocolate ones are better." She said while maintaining eye contact on Fire, who was now breathing into a paper bag. Dunnie approached her, "Fire, you're overreacting. There is nothing to be freaking out about, there is no part of me that you need to fix. The magic can be undone at a moment's notice, if we so wish." Dunnie said, motioning to the golden bracelet on her fore leg. While putting her hoof down, she resisted the urge to stop the ground. "You're just going to have to accept it." Her voice stayed strong, not revealing the burning fear in her gut. "Only if it would make you feel better," She spun around, and trotted back towards Bevel, "We could showcase this device?" It all made sense now. Every last bit of luck left for Dunnie was used up with Bevel offering to turn her into a mare. After the vacation to the changeling isles and going back to work at the Blueblood manor, all that has followed the transformation have been encounters with ponies who have known her since before the transformation. Even though she knew that such encounters would eventually happen, she had hoped to enjoy life as a mare and suffer awkward reunions later. However, it seemed fate put Dunnie against one of the last ponies she wanted to see again. Her legs locked up, her teeth gritted, ever muscle in her body stiffened up. What will she say? What will she think? Will she keep being my friend? Will she never talk to me again? Thoughts of fear buzzed through her mind, but the jig was already up. There was nothing to do, except to prove how minimal the differences were. The look of shock slowly gave way to a wide smile. "Fire!" She zoomed to embrace the red pony, squeezing her tight and nuzzling her neck. "Long time no see!" Fire would get a whiff of Dunnie's perfume which carried a light fragrance of fresh strawberries. "How have you been? We need to make sure to keep in touch better!" Greeting her like this felt natural. She was still the same pony inside, even though her appearance changed. "Oh, yes." Dunnie released Fire to look at Bevel, "We have known eachother for a long time, actually. Went on quite a few expeditions, ey, friendo?" She beamed at the mare, giving a light nudge with a firehoof against the chest. Returning home was supposed to be a time of gracefully resuming one's work and responsibilities with a sense of rejuvenation. This time, Dunnie was eager to resume work as a cook of the royal house because her time on vacation left her more stressed than relaxed. She mostly was alone in her cabin, only coming out for "essentials" while dodging others. Maybe going straight to such a public and romantic place so quickly was not a good idea. Surely, she thought, getting used to a life like this would be much easier at work where she was practically family with everypony else there. Or so she thought. She unlocked the front door with her key and entered, only taking a few steps inside before glancing around. Same as normal. Her eyes rested on a guard for a moment, to whom she shyly looked away with her head lowered to trot in the opposite direction. "YOU THERE!" She jumped as the thunderous voice behind her broke the silence. "How did you get in here?" She spun around, "I, uh... Used my key?" "I know all the ponies who have the house key, and I don't remember you." The guard squinted his eyes at the mare "Actually, you look familiar. You look like you could be one of their sisters or something." "Well, I can go back to my room. I have pictures of me and Blue--" she cut herself off when remembering the nature of the pictures, but the guard was not having it. He shook his head. "Sorry, but you aren't allowed in here." His voice carrying a slightly apologetic tone, "You can tell your brother that you're welcome to visit if you make an appointment.." Now, Dunnie was getting frustrated, "You must be new. I actually outrank you since I am a member of Bluey's personal retinue. So please let me get to work. You're gonna love my hash browns and omelettes." "You have 10 seconds to leave, or else I will force you out!" He raised his voice again, a drastic shift front the more comforting tone from before. He was frustrated too now, not liking the lip he received. New beginnings: part of the reason why Dunnie had chosen to come to ponyville at all. With her new looks, it was almost like she had never stepped into the town before. Not that she was tunning away from her memories of the town, instead she wanted to create new, happier ones. And in what better company than that of her good friend Bevel. Such a sweet mare, helping out a friend in need in such an ingenious way. As they made their way to the castle, Dunnie looked at the bracelet around her left forehoof. It was currently gold, and giving off a brilliant shine in the summer sun. To imagine something so simple could cause such a change. Her mind was snapped back to reality when she heard a familliar accented voice. "Oh! Does it seem like it is not working? I only saw myself in the mirror for a moment this morning, but I saw a mare." In an instant she became a bit flustered, she brought a wing up to brush her mane, which was long and brought down, straight at the top but a bit wavy near the bottom. "Also you said your friend was the one who got us the tour." She said, a bit scatterbrained as usual, "Did you say who the friend was?" Clank A mechanism in the door sprung to life. "So they were expecting us." The door began to swing open, "I hope we aren't laa--" her eyes shot open when she saw the red mare inside the castle, "Fire?!" "Is not my fault Equestrian is hard to read!" She protested, jumping to her own defense. Memories of her frustration staring at the same characters, trying to memorize the specific sounds they made based on where they were and how they were written. Drawing pictographs was much more efficient once one became familiar with what each picture meant. No more pesky letters and the same word meaning 5 different things. "Maybe later you can give me some books to read! Though I might need some help reading them." She admitted. When they reached the main warehouse, Cemmoyāhua got low to the ground to stay as hidden as possible. "This stallion is not like the 'baddies' you are used to encountering. He is a clever and ambitious pony who is pushing his luck, not a... 'muh-fee-yo-so'. This is probably as many guards he could hire without drawing too much attention. But tonight they would be stretched thin, that's why we are here. He has a lot of inventory moving around that still needs to be protected." After scanning along the walkways and the interior of the room from their poor vantage point for a moment. Wooden boxes stacked on top of each other bound in rope and rivets should provide sufficient cover. she spoke up again, "We need to get to a higher vantage point. If we are where I think we are, his main office should be on the other side of the warehouse." She looked up, "Do you think you will be able to fly me up? Or will I have to climb on some boxes to get high enough? It would be no trouble, I have climbed trees much more challenging than some boxes." Some of the boxes were stacked in a way that some acrobatic skills, one would be able to get to the second floor. Alternatively, there might be a ladder or staircase somewhere, but who could guess where and how well they would be watched. Being the test subject of so many experiments had its repercussions. Even if those experiments involved temporarily gaining an extra wing, or losing all hair, or losing all motor skills all issues would be suffered until the Fancy inventor undid whatever horrible affliction that had been done onto the test subject. This time, however, the effects were not ones that needed to be resolved immediately. Her new name was Dunnie. Once she was a a stallion, but now her friend had given her a whole new body with one of his experiments. Gearbox was most likely off getting himself into trouble in his own ways with his brand new body. Dunnie, following suit, figured the best place to get into trouble would be to take up the offer of a 'free' vacation. On a whim, she boarded the ferry with little more than a sun hat and a pair of shades over her eyes. As she rested her hooves over the railing, her mane and tail blowing gently in the salty ocean wind. She enjoyed the climate for once instead straining to fly from island to island as the ferry drifted along the waves. Until the ferry landed, at which point she was ready to disembark to greet their hosts. With the other guests, she gathered in time for the queen to give the official welcoming. After the changelings had tried and failed to take the capital, maybe they had truly let go of their old ways and would try to embrace co-existing with ponies. Dunnie believed in second chances, so she was open to the idea of giving these creatures theirs. She chose to stay quiet, though. Still, she was not used to her voice.